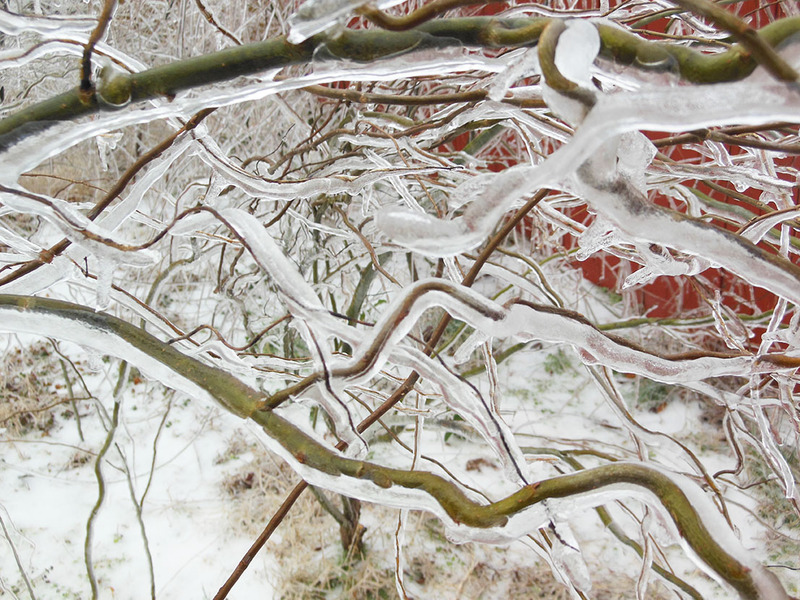 A corkscrew willow with flexible limbs that easily accommodate the ice without snapping. Punxsutawney Phil was right: six more weeks of winter. Just when I was putting the finishing touches on a blog entry regarding winter annual weeds, the henbit, chickweed and wild garlic quietly disappeared beneath a blanket of ice yesterday. The shrubs and trees weren’t so lucky. Some of them looked like reluctant contortionists bent into painful shapes. Those whose branches refused to bend simply broke beneath the weight of the ice. Unlike snow, which can be brushed off without damaging the limbs, ice requires a hands-off approach. Be patient and do nothing; allow the ice to melt naturally. For trees the best defense against storms is a strong, weather-resistant crown and trunk. This can only be achieved with structural pruning for the first 15 to 20 years of a tree’s life. That’s right: 15 to 20 years. Like raising a child to adulthood, a young tree must be structurally pruned to develop a pyramidal form with a dominant central leader. Smaller branches must be distributed vertically and horizontally around it. Codominant stems of equal diameter must be removed or subordinated (pruned to supress their growth and eventually removed) because they are often poorly attached as evidenced by the included bark; they split apart like wishbones during ice-and windstorms. 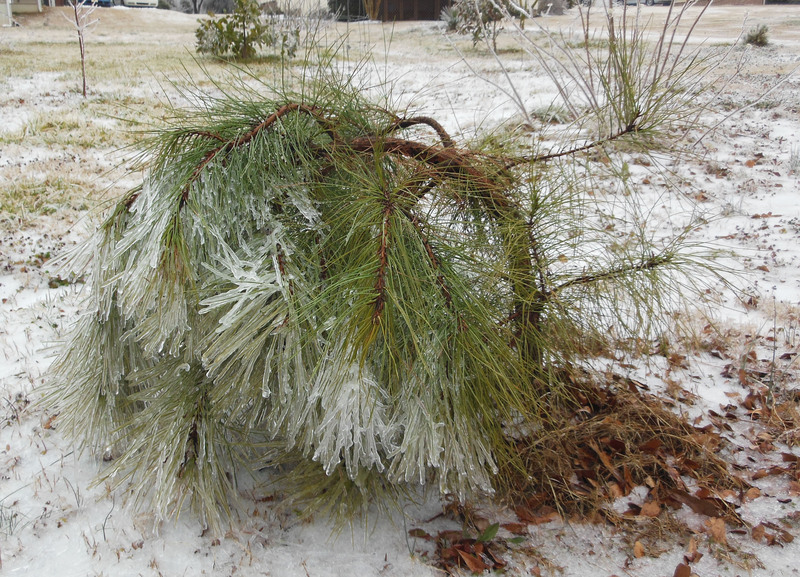 A contorted loblolly pine (sadly, the contortion is due to ice accumulation and not genetics). Structural pruning develops a framework of well-spaced, strongly attached limbs. These biomechanically sound trees reach middle-age and are less likely to burden you with costly tree failures. Ideally, structural pruning begins in the nursery and continues in your landscape. Individual branches should be spaced around the trunk and not clustered together at one point. Single branches create strong attachments with the trunk: as the branch and trunk grow radially (produce annual growth rings), wood from the branch and trunk overlap. Over time the branch looks like a threaded dowel that was screwed into the trunk. Oftentimes you’ll see a swollen area at the base of limb: this branch collar results from the overlapping of branch and trunk tissues, which indicates a strongly attached branch.Most importantly, the collar houses a natural protective region called the branch protection zone. This unique zone of cells, which develops at the base of the branch and extends into the trunk, resists the invasion of decay-causing organisms into the trunk when the branch dies or is removed—providing that the branch was removed just outside of the collar. Remember this: the branch protection zone develops on individual branches that are less than one-half the diameter of the parent stem which are also less likely to break-away from the parent stem. Finally, you need to know that pruning creates wounds. The openings created by the removal of branches seal more rapidly on small diameter branches than large ones. So, if you experience empowerment and gratification from sawing through large, hefty branches, consider pruning dead trees. Despite the woodchuck’s dire forecast, I trust that our winter will be interspersed with brief warm spells. During the next spate of warm temperatures, go outside and examine your living investments. Think about structurally pruning your dormant trees to improve their strength, health, and longevity. ← Wild garlic are blemishes in the winter lawn.